Self Contained Mobile System - Offers built-in reverse image switch, hands-free motorized optical Zoom-in and Zoom out (1X to 23X), hands-free Image freeze frame, light intensity controls and a digital zoom (up to 46X). 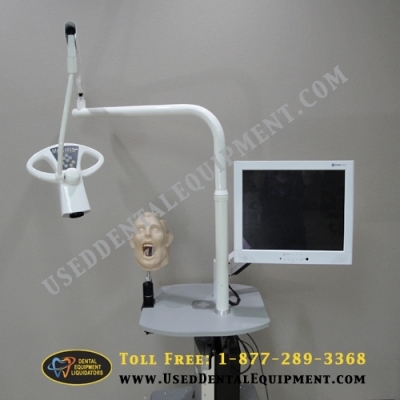 The system is comprised of a dental scope with built in light source, a monitor, a training mount with training props and a wide base mobile base. The dental scope has a working length of 6-18 inches and is capable of 23x optical/46x digital zoom. Another feature of the scope is the ability to reverse the image on the screen to simulate looking through a mirror. This lessens the learning curve for some clinicians by providing images normally observed clinically. The built in dental light source is comprised of four Light Emitting Diode (LED) light sources converging to provide optimum lighting of the operating field that can be adjusted to suit the operator’s needs. The system includes a 19-inch LCD externally sealed monitor. The MagnaVu scope comes equipped with two RCA and two S-video outputs. It has the ability to view images on a monitor, the system can capture video and still images directly to your computer or to an external device. A nice design of the system is the integrated foot pedal that allows the provider to control several functions of the system without having to touch the scope with gloved hands.